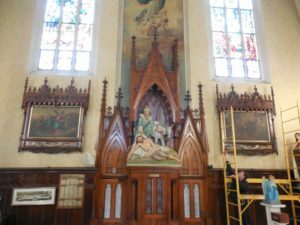 We were recently hired to restore two Stations of the Cross that had sustained water damage from leaking windows. 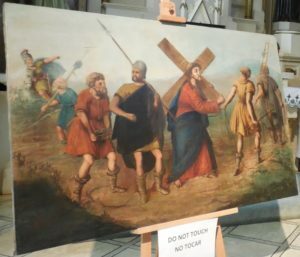 The initial inspection was challenging as it required a 10” ladder just to reach the bottom of the paintings! 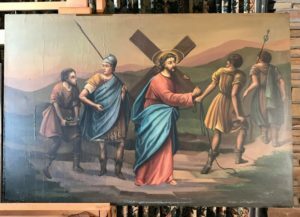 Two large paintings for restoration. Restoration work corrected the water damage and uncovered an older restoration on Station 2 that had covered up some of the original image. Station #2 – Pre-treatment. Notice nothing in top left corner. Station #2 – Post treatment. Notice the soldier and horse in upper left. 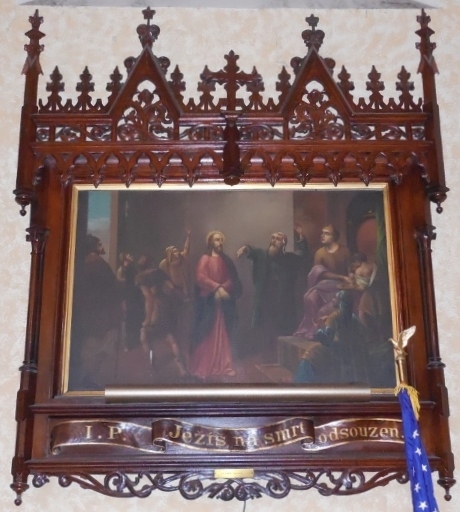 Once completed, the paintings were displayed for the parishioners to view up close. 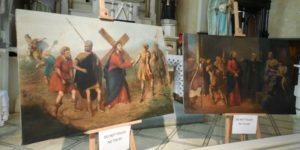 Stations 1 & 2 on view for parishioners to admire. 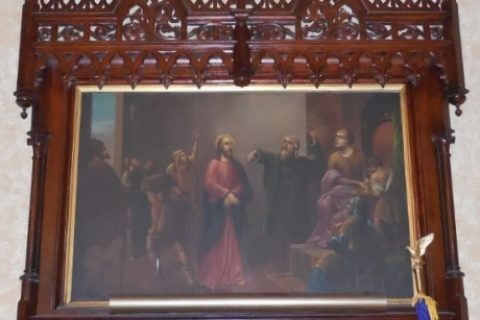 The paintings were mounted back in their frames (Video) and the paintings were re-hung only after the windows were repaired and mounting brackets on the wall were re-built. This project took 8 months from start to finish. Everyone was happy and the cleaning of the other 12 Stations has begun! No project is too big or too small. Contact me today to discuss your needs.